Caribbean inspired caserole | Life's Conundrum - Eat to Live or Live to Eat? It has been a while since we last cooked a casserole as our oven had given up on us and the replacement table top oven did the same a week ago. We have since replaced it with another table top oven but with a built in convection fan which in theory should allow us to cook food more evenly. We baked a gluten free chocolate cake in the oven earlier in the week and it seems to work fine. Tonight we revisited a dish we made nearly six months ago and have been wanting to cook it again as we thoroughly enjoyed our first attempt at jerk chicken. Rather than cooking the dish as originally prepared, we tried to be a bit creative and decided to replicate the flavours in a casserole instead and incorporated the black beans and rice into the dish versus an accompaniment as we had done previously. The dish is more akin to a creole jambalaya in consistency than a casserole as there was very little liquid left. Interestingly the dish seems quite balanced despite having some strong spices like all spice, cloves and nutmeg. 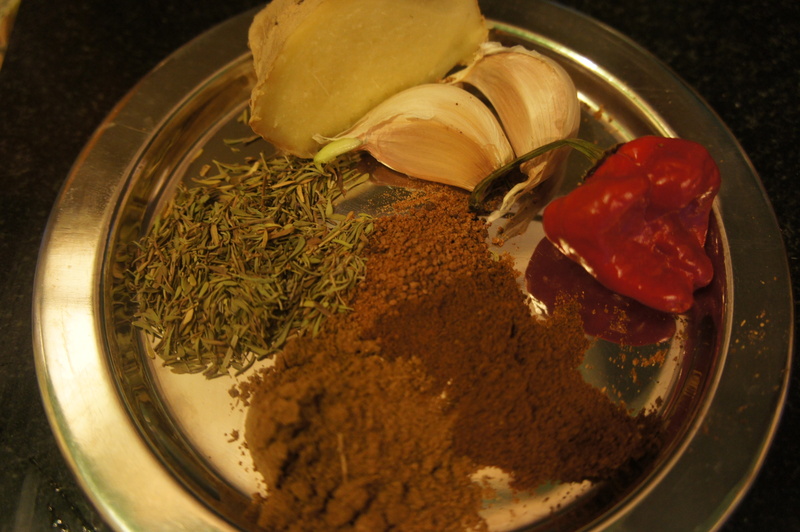 For the marinade, use a pestle and mortar to crush the garlic, ginger and scotch bonnet pepper to a paste. Then add the remaining ingredients and mix well. Place the chicken thighs in the marinade and keep aside for an hour at least – the longer the better. Heat your oven proof casserole dish and sear the chicken thighs on both sides till they colour a little bit. Remove from the casserole and save any liquid to put back into the dish. Wipe the casserole with a paper towel and return to heat. Add 2 tablespoons of olive oil and saute the garlic and scotch bonnet pepper for 30 seconds before adding the celery and spring onions. Continue sauteing for five minutes before adding the black pepper, dried thyme, all spice powder and Malibu rum. 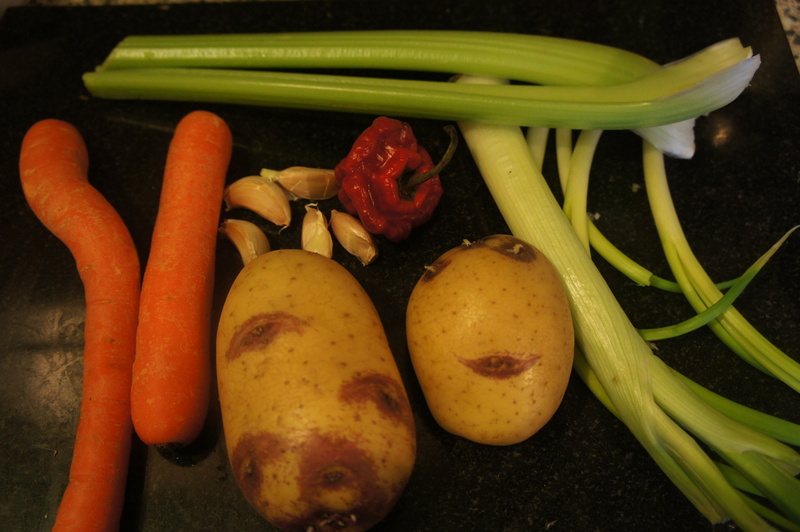 Give it a good mix and then add the potatoes and carrots with the stock cubes. Pour in the black beans with any remaining cooking liquor and the washed rice. Add 1 cup of water and place the seared chicken thighs on top. Cover the casserole and cook in a pre-heated oven at 200 degree Centigrade for an hour till the chicken is done. Serve hot. 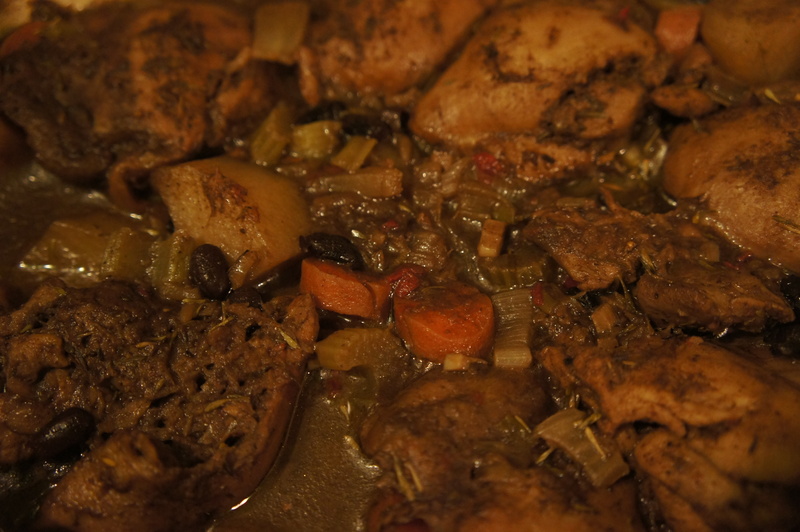 Posted on January 19, 2014 by Anna and Shiv	• This entry was posted in Main courses, Recipes and tagged all spice powder, Caribbean, Jamaican jerk spice, jerk chicken casserole, Scotch Bonnet. Bookmark the permalink.